Ahead of the recent release of the new Hearthstone expansion, Kobolds and Catacombs, an eagle-eyed Reddit user discovered some pretty glaring similarities between one of the expansion’s new cards and 17-year-old Magic: The Gathering card. 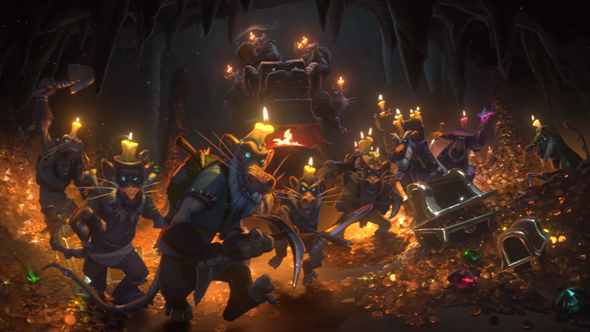 Here are all the Hearthstone: Kobolds & Catcombs cards. Violet Wurm is an eight mana 7/7 beast whose Deathrattle effect summon seven 1/1 grubs. 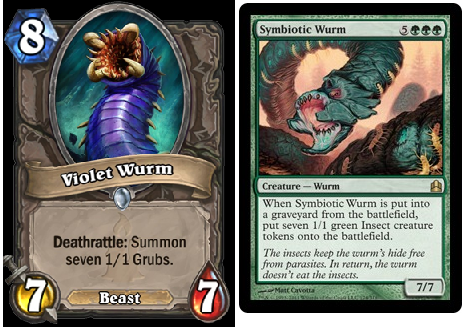 By contrast, when MTG card Symbiotic Wurm “is put into a graveyard,” players can put seven 1/1 green Insect creature tokens onto the battlefield. You can check out the two cards here. The real kicker, though, is that the two cards were actually designed by the same person. Mike Donais, principal game designer on Hearthstone popped up in the comments on the post asking “is it still copying if I designed Symbiotic Wurm for [2002 MTG expansion] Onslaught 17 years ago and then designed it again for Hearthstone?” When asked whether he thought anyone would notice, Donais replied that he himself had forgotten about Symbiotic Wurm, and was only reminded of the similarity between the two when he saw the thread. If you’re eagerly awaiting your chance to play Kobolds and Catacombs, you’ll likely want to know when the expansion releases. In the Americas, you’ll be able to play right now, as the expansion has gone live hours ahead of schedule on NA and EU servers.